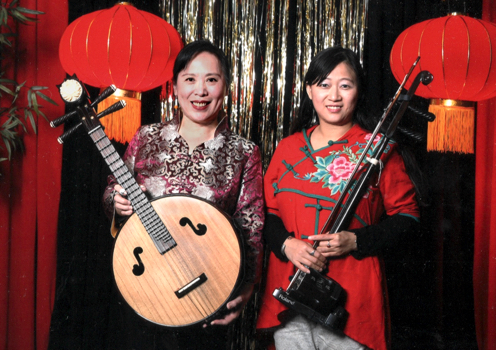 Traditionally, Chinese music is performed on instruments such as the erhu/Chinese, ruan/Chinese zither, dizi/Chinese flute, zheng/Chinese zither, and percussion. Today, western instruments, such as the cello and bass, are also used very often, especially in larger ensembles. The repertoire ranges from energetic and lively dances to graceful melodies, from ancient classics to works written in the 20th and 21st centuries. It includes different styles developed in different regions: Silk & Bamboo music (Shanghai), Cantonese music (Guangdong & Hong Kong), folk songs from various provinces, as well as compositions rooted in folk music or operas. Zhimin is a member of the Sound of Dragon Ensemble, Red Chamber, BC Chinese Ensemble, Silk Road Music, and Vancouver Chinese Ensembles. In addition, she leads her own projects to perform Chinese chamber music. As a composer, her works have been performed by various groups, released on CDs, and featured at the Sonic Boom Festival. Zhimin has premiered numerous works by Canadian composers and performs a duo with guitarist/composer John Oliver. Zhimin has performed as a soloist with Vancouver Symphony Orchestra and Calgary Symphony Orchestra and toured in Canada, the United States, Britain, France, Holland, Hawaii, Indonesia, Philippines, Malaysia, Japan and Hong Kong. Zhimin was born in Beijing, China. While studying as a student, she was chosen to perform for foreign states’ guests and leaders. Zhimin Yu joined the top orchestra of China at the age of 17 (CCTV Broadcasting Symphony Orchestra). She has given many performances around the world, including live concerts for BBC (London), NHK (Japan), CCTV (China), and CBC. Zhimin has appeared on many CDs. She has taught at UBC Asian Center and Beijing Children’s Palace Station. She is currently faculty at Vancouver Symphony Orchestra’s School of Music.